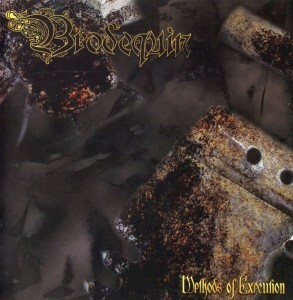 In the decade that the band was originally active, from 1998 to 2008, Brodequin released three albums, of which “Methods Of Execution” was the last. On “Methods Of Execution” all the pieces fell in place. For the first time the band had a production worth mentioning, and the presentation finally lived up to the concept. Armed with a new drummer, and stronger song material Brodequin ended on a high note. As such “Methods Of Execution” is the only Brodequin record worth seeking out. Creative differences between guitarist Mike Bailey and Chad Walls led to the latter’s ousting in the pre-production phase of the third album. Making his recording debut with Brodequin is drummer Jon Engman. Engman is a suitable replacement for Walls, as both men have a similar drumming style. For the first time Brodequin was able to self-produce a music video, ‘Slaves to the Pyre’ was given the treatment. As before the lyrics of Brodequin detail the various methods and techniques used through out ages. On “Methods Of Execution” these include death by fire, death by pressing, and death by drowning (‘Verdrinken’ translates to ‘drowning’ in Dutch/Flemish). ‘Tyburn Field’ is about the English village of the same name which was synonymous with capital punishment, especially for religious martyrs and traitors, during the 18th century. As before Brodequin details a number of torture devices, this time being the gridiron, the guillotine, and thumbscrews. In comparison to the preceding two records “Methods Of Execution” has far more diverse riffing. Most of the songs can actually be told apart as there’s a greater variety of rhythms within the repertoire of the album. All three tracks of the 2003 “Prelude to Execution” EP make an appearance here along with a selection of all new material. It seems as Brodequin did a concerted effort to vary up its music, and of the three records that the band cut in its orginal run, “Methods Of Execution” is the strongest. The biggest strike against the record are still the entirely monotonous vocals. A bit of narration in ‘Tyburn Field’ notwithstanding the vocals are another percussive aspect to an already dense and intensive assault. Whereas progression was made in terms of production, presentation and composition – the lyrics sadly have fallen behind. While still purely descriptive of the atrocities inflicted upon the victims of the instruments of torture, Bailey’s lyrics aren’t quite as imaginative, nor as strong, as on the previous two releases. Much like erstwhile Disgorge frontman Matti Way, Jamie Bailey is mostly famous for his guttural depth but an unfortunate byproduct of that is that his occasionally interesting lyrics are overlooked due to the sheer monotony of his delivery. Whereas the previous two records had superior descriptions of torture devices, one can only imagine what could have been had more time been spent on penning better lyrics and expanding the array of vocal techniques. “Methods Of Execution” was recorded at Asylum Studios in Milwaukee, Wisconsin with Tim Bleske producing. It was mastered at Mastermind Studios in Milwaukee, Wisconsin by Trevor Sadler. For the first time the bass guitar and drums can both be heard clearly. The guitars sound less crunchy than on the preceding record, and some of the clarity was lost. Once again the layout and design was handled by Jamie Bailey for Voodoo Design Studio. It is the best Brodequin product in terms of artwork, design and layout by a wide margin. For the first time music and visuals work in perfect symmetry. Once again the album was released through the band’s own Unmatched Brutality Records. The addition of a new drummer had lit a fire on the Bailey brothers, and as a result “Methods Of Execution” was far more diverse and intense offering. Despite having a fascination with various forms, techniques and instruments of torture since forming “Methods Of Execution” was the first to live up to its concept. The trio did a concerted effort to vary up its music, and the superior production work was some of the best they had experienced up to that point. “Methods Of Execution”, the final album of the band’s original run, is the only worth seeking out. 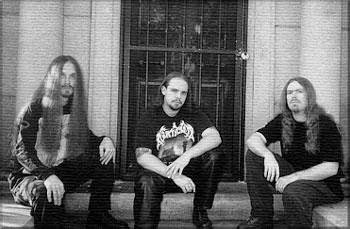 In the decade that the band was originally active, from 1998 to 2008, Brodequin released three albums, of which “Festival Of Death” was the second. On “Festival Of Death” Brodequin narrowed down its chosen subject matter to a very specific concept. Aided by a reasonably functional production, and slightly improved presentation, “Festival Of Death” is where Brodequin manifested itself a entity to be reckoned with. It wouldn’t be until this album’s successor that the trio truly showed what they were capable of. 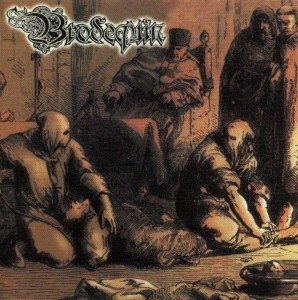 On its second album Brodequin focused exclusively on torture in medieval times, as before primarily the devices used, and the institutions or persons that used them. A portion of the album concerns itself with torture techniques inflicted upon heretics and apostates in medieval Europe. “Festival Of Death” was step up in terms of artwork, design and layout. Once again the layout and design were handled by Jamie Bailey for Voodoo Design Studio. While still obviously a low-budget affair the second Brodequin offering was a marked improvement over the amateurish “Instruments Of Torture”. “Festival Of Death” details the mazzatello, the judas cradle, and the Spanish ticker (or Cat’s Paw). Described also are rat torture, burning at the stake (here with ‘Auto de fe’, that derives its name from the Portugese “auto-da-fé” or “act of faith”), exposure (‘Vivum Excoriari’), death by drowning (‘Lake Of the Dead’). Both ‘Bronze Bowl’ and ‘Torches Of Nero’ detail the horrifying torture emperor Nero inflicted on persecuted Christians during his reign in ancient Rome. Uncharacteristic for the record is ‘Gilles de Rais’, which roughly chronicles the life and work of the 15th century French nobleman of the same name. Gilles de Rais, who was a companion-in-arms to Jeanne d’Arc, became infamous for his reputation and later conviction as a serial killer of children. Belgian death/black metal combo Ancient Rites also detailed his life on “The Diabolic Serenades”. Brodequin decided to convene at Digital Sky Studios for a second time, and the studio had now relocated to Daytona Beach, Florida. As before Mike Sky was responsible for the recording, mixing and mastering of the album. This time around Sky was able to at least capture the essence of what Brodequin was trying to convey. One of the more notable improvements was the thicker, crunchier guitar tone, and the far meatier sounding vocals. The drums, while better produced than the previous effort, have an annoying ringing sound. The bass guitar is more felt than that is heard as it tends to be buried under the wall of guitars and drums. Bailey’s vocals have the same guttural depth as Will Rahmer’s work on the Mortician debut “Mortal Massacre”. The artwork on the frontcover is an illustration taken from the 1880 chronicle “The Rise of the Dutch Republic” by American historian John Lothrop Motley. “Festival Of Death” was released on the band’s own Unmatched Brutality label imprint, and allegedly sold in excess of 10,000 copies worldwide. It was re-released a year later, in 2002, on tape format through Indonesian label imprint Extreme Souls Production. There’s a hidden track ‘Raped In The Back Of Chad’s Van’ that is a cover version of the Last Days Of Humanity song ‘Raped In The Back Of A Van’. It an interesting choice of cover considering Last Days Of Humanity lean closer towards earliest Carcass as far as influence go. Brodequin on their part are more conventionally death metal. ‘Judas Cradle’ was recently covered by California/Colorado combo Embodied Torment. 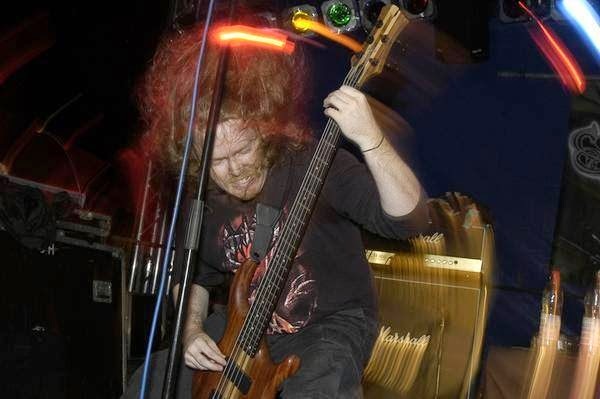 While not the first to take death metal into more extreme and fast territory, Deeds Of Flesh and Disgorge preceded them to it, Brodequin stripped the genre to its elementary basics. Pushing the minimalism of goregrind with the crunchiness of death metal Brodequin was the first to combine both subgenre in the way that they did. On “Festival Of Death” the band finally had a production that played up to its strengths. As bands like this go this is not the record to look for in terms of diversity. Brodequin is about speed and heaviness first, and songwriting second. All songs tend to sound very similar with very similar riffs and chord progressions being used. It wouldn’t be until the Brodequin record, and its original swansong, “Methods Of Execution” that the trio showed some minor evolution.